Maria Paris Newill is one of two Managing Directors for the Firm of Heckler & Frabizzio where she has worked since 1990 representing Employers and Insurance Companies in Workers’ Compensation matters before the Delaware’s Industrial Accident Board, Superior Court and/or Supreme Court. Ms. Newill attended the University of Delaware, Newark, Delaware (December 1986, B.S.A.S.) graduating from University of Delaware with a major in Criminal Justice and minor in Psychology (degrees completed in 3 ½ years). Ms. Newill then attended Oklahoma City University School of Law, Oklahoma City, OK (May 1990, J.D.) while her husband was stationed in Oklahoma, serving in military. Ms. Newill graduated from Law School in top 25 % of the class in May 1990. Ms. Newill successfully passed the Delaware Bar on her first attempt and was admitted to the Delaware Bar, January 7, 1991. She is also admitted to U.S. District Court for the District of Delaware. 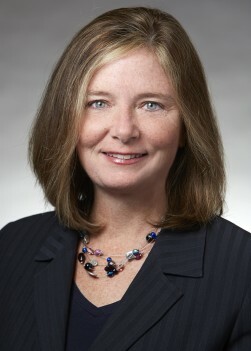 Ms. Newill’s professional activities include: Associate at the Law Firm of Heckler & Frabizzio — 8/1/1990 to 1997 and then Director at the Law Firm of Heckler & Frabizzio 1997 to present practicing in Workers’ Compensation Litigation – Insurance Defense where she has handled over 2500 claims within Delaware’s Industrial Accident Board, Superior Court and Supreme Courts on behalf of self-insured employers, employers, and/or insurance companies. Delaware State Bar Association; Workers’ Compensation Section of the Delaware State Bar Association; Women and the Law Section of the Delaware State Bar Association, National Association of Professional Women VIP Member, Lawyers of Distinction, Defense Counsel of Delaware; Defense Research Institute; and Council for Litigation Management. Additionally, Maria has received the Delaware Top Lawyer for Workers Compensation by Delaware Today Magazine for 2015 & 2016. Ms. Newill has held many positions within the Workers Compensation Section and Women and the Law Section of the Delaware State Bar Association including Chairpersons of each of these Sections. Ms. Newill also served on The Delaware State Bar Association Nomination Committee (3 year term). Ms. Newill has been a voluntary judge for the Delaware’s High School Moot Court Competitions and has worked pro bono as a Guardian ad Litem in Delaware’s Family Court representing children in foster care. Personally, Ms. Newill has been married to her husband, James F. Newill, since 4/28/1987. She is mother to two boys, Nicholas and Charles Newill. Ms. Newill’s civic participation includes or has included: Smyrna Downtown Renaissance Association – Board Member, current Chairperson; Organization Subcommittee of SDRA – Member; PEO (Philanthropic Education Organization raising money for Women’s Education) – Member; Development Subcommittee of Duck Creek Library Guild – Former Member; and Cotillion Subcommittee of the Smyrna Opera House in Delaware – Former Member. For fun, Ms. Newill enjoys being on or near the water, antiques/auctions, historic preservation, movies, music (especially blues), reading and spending time with family and friends.